One year ago today, I woke up with an unusually steely resolve for what I was going to accomplish that day: I was going to start a foodblog. It had only been a short time since I had stumbled upon this mysterious universe – a slow day at work and a sudden curiosity about the cuisine of the Seychelles had dumped me unceremoniously in the archives of Chocolate and Zucchini – but my induction had been thorough. I had read my way, feverishly, around the food blogosphere, awed at the effort and talent that people were putting into these online food journals, and absolutely over the moon that there were apparently so many people out there, who like me, couldn’t spend a day without thinking about food. Although it’s very uncharacteristic for me to take any potentially life-altering plunge without thoroughly considering the ramifications – I am a Libra, after all – this one didn’t require even five minutes of debate. I had just found a community of people all talking about my favorite topic, and what I wanted more than anything was to join in. I had, at that point, no clear idea of what I was going to write about or how long I would keep going – I just figured I’d write about whatever, whenever, as long as it had to do with food. Somehow that has managed to span everything from hot chocolate to whiskey; haggis to squash blossoms; weddings to breakups; homecomings to home-leavings to family secrets; humorous personal disasters to gut-wrenching faraway catastrophes. Along the way I’ve probably just about managed to circumnavigate the globe in recipes. Reading, interacting, cooking and writing this way have proven to be more than just an ongoing culinary education for me – it’s been an education in culture, in history, and in people. Just as amazing have been the unexpected and delightful ways in which the consequences of starting this website have spilled over and affected my ‘real life’. The friends I’ve made, both in the flesh and virtually, the countless positive interactions I’ve had with people through emails and comments, and even the professional opportunities that have come my way, have made each and every day of the past year a little bit brighter. Who would have thought that a little food blog could do all that? And today, 365 days and 86 posts later, the journey still feels like it has barely begun. My passion for food is as great – if not greater – than ever before, and I’m constantly thrilled to discover how many more avenues there are to explore. So to all of you who have taken time out of your busy lives to drop by here and share your thoughts, your knowledge and your experiences with me, and to all my wonderful fellow foodbloggers, who make this community so dynamic, so supportive, and so mouth-wateringly delicious: thank you. You have all helped to make this one decision I have never regretted even for an instant. Notes: This unusual cake caught my eye the first time I leafed through Rick Rodgers’ Kaffeehaus, a gorgeous exploration of the pastry-making traditions of Central Europe. Unlike most poppyseed cakes I’m familiar with, this one contains no flour, instead relying on ground poppyseeds to provide both flavor and bulk. The result is something both visually striking – the color is almost blue-black – and delicious, as the cake is deeply imbued with the poppyseeds’ uniquely nutty, floral fragrance. If you grind them coarsely, you’ll have a lovely crunch as well. Just make sure to purchase your seeds from a place with high turnover (such as a bulk source, or an Eastern European market), as they go rancid and bitter all too quickly. Also note that I’ve suggested some optional flavorings for the cake – while the poppyseeds are good on their own as the original recipe presents them, I think they’re even better with a hint of vanilla, almond or citrus in a supporting role. Preheat the oven to 350F/180C. Lightly butter an 11×8-inch baking dish (I used a 9-inch/23cm springform pan). Beat the butter with a hand-held mixer until smooth, about 1 minute. One at a time, beat in the egg yolks and continue beating for another 2 minutes. Beat in the sugar. Using clean beaters, beat the egg whites in another bowl until they form soft peaks. Stir about 1/4 of the beaten egg whites into the butter mixture, then fold in the remainder, stopping before all the whites are completely incorporated. Fold in the poppy seeds, then the cream and optional flavoring. Spread the batter evenly in the pan. Bake until the top of the cake is puffed and lightly browned, about 40-45 minutes. Transfer to a wire rack and cool completely before serving. Notes: I concocted this ice cream on the spot, imagining that the slightly acidic crème fraîche and spicy nutmeg would compliment the mohnkuchen well, especially as I had used orange peel to scent the cake and thought this would make a lovely flavor trinity. It did in fact, and I was also happy to find the ice cream equally good on its own (though I am a nutmeg lover – Manuel, on the other hand, couldn’t get the thought of frozen béchamel sauce out of his head…). m heat, cover, and allow to infuse for 30 minutes. in a bowl whisk together egg yolks and remaining 1/4 cup sugar and hot cream and milk mixture in a stream, whisking. Return custard to pan and cook over moderately low heat, stirring, until it thickens and registers 170°F on a candy thermometer. Remove pan from heat. Stir crème fraîche into custard until combined well and strain through a fine sieve into a bowl. Chill custard until cold and freeze in an ice-cream maker according to its instructions. Alternatively, freeze in a covered container, stirring vigorously to break up the ice crystals every couple of hours. what a year indeedy! here’s to many more.. i have enjoyed every entry! happy one year anniversary! This is an awesome food journal and I hope it continues the wonderful journey. No .. thank YOU. Happy anniversary! Happy anniversary! Thanks for sharing your food ramblings, recipes, and wonderful photos with us! Happy 1st Birthday, Melissa! I still have so many of your posts to catch up on but I’ve enjoyed all that you have written about since I’ve stumbled upon your blog – thanks! Happy birthday to you and your little baby! I am very happy to have stumbled across YOUR blog and take great pleasure to always learn a little more each time about you, from the Tom boy to the cookbook addict, not even mentioning the great writer and photographer that you are. As to the cook, I have to taste ahahahah! 😉 just kidding, I can "smell" it through the pictures! I look forward to reading more!!! 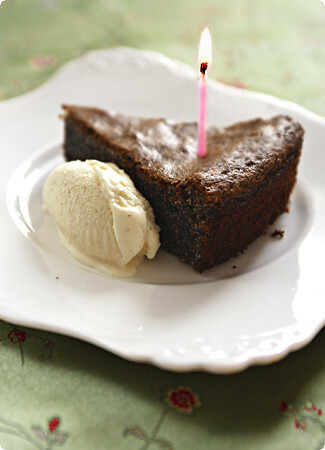 And let’s talk serious matter here, what about this chocolate cake recipe, What does "post it soon" mean? 😉 There is an emergency here! Hey, happy birthday! (My blog turns one on Saturday. )I remember when I first found your blog, how inspired I was by the content and photography. I still am. Glad you’re around. Happy birthday to your blog. I’m really glad you decided to start it. hi melissa, happy blog birthday! may there be many delicious years ahead for the traveler’s lunchbox…visiting is always a treat and an inspiration! Melissa,Happy birthday to your blog! It is so beautiful and polished, it’s hard to believe you’ve only been doing it for a year. I always look forward to visiting, and look forward to many more inspiring entries! Happy Birthday! :o)Here’s wishing you many, many more.Thank you for being here. Congratulations to you and your lovely Lunchbox. It is a pleasure to read, and obviously a pleasure to you as well.Many happy returns. Happy Blog Birthday! I missed mine too, earlier this week. Thought it was today but it was actually the 23rd.I love your blog and always eagerly await the latest posts. Happy Day! Be proud!! Happy birthday!I just want you to know that your blog is one of the reasons I stayed up late one night and decided to start my own food blog.By the way, that looks like a fine scoop of ice cream beside your birthday cake. Is there a story behind it, too? Happy birthday Do continue to inspire us! Happy birthday, traveler’s lunchbox! Looking forward to reading more of your wonderful posts. Melissa, you and I began our blog adventures around the same time. Who would have thought we’d make it this far and have cultivated a great friendship at the same time? It has been a pleasure getting to know you and sharing culinary experiences with you. Here’s to another great year! Happy Blogday, Melissa! Congratulations for a wonderful year of writing. Can’t wait to read about the Mohnkuchen – one of my favorites. Keep up the fantastic work! Happy Anniversary to you! Your blog is not only informative but beautiful as well. Thanks for the constant inspiration. Like many before me, I’m grateful I found you. Congratulations on your anniversary, and thank you for taking the time and the energy to share some of yourself with us. Happy, happy anniversary, Melissa! I find your Lunchbox a lovely place to poke through, sample from, and savour. Long may it delight and inspire! Melissa,My most heartfelt congratulations! Your pure, unadulterated love of food just shines through and it makes your blog an inspiring place to visit all the time.I hope the next year brings you more of the same delights you experienced in your blog’s first year of life.Tanti saluti! This (the Rodgers book) is another cookbook I’m fascinated with! So far, dispite having it for some time, I’ve only made one or two of the recipes. I do love to leaf through it and admire the dreamy images of beautiful pastries and lovely coffeehouses -they seem to invite lingering, reading, and talking. Maybe I should get to some cooking, though. Happy Anniversary! You have a wonderful blog! Happy Birthday to this stunning blog! You are such a cut above the rest, an absolute inspiration and a joy to read! Wishing you many more years of creating beauty and sharing your talents with the rest of us. Happy blog birthday, Melissa! You blog was the second I discovered, after reading through Catherine’s archives at Food Musings (anything with the word travel in it is an instant draw for me). I loved it at first sight, and am continually impressed by the high quality of writing and photos. So thank you for the beauty you share with us. I’m selfishly wishing for many, many returns of the day! Happy Blog Anniversary. Love your blog ! happy birthday, travelers lunchbox n mel! i have read all ur posts i think, n although i m no cook, i find them delightful n gorgeous. the table cloth in ur photo is so pretty, where did u buy it?? ?by the way i made the soup, ooohh, i love it. m gonna go to tjom n make it, they will all be so impressed. Many happy returns!Loving what I find in your lunchbox!! Hi Melissa,Hope I’m not too late to wish you, and the Traveler’s Lunchbox, a Happy Birthday (sorry, I haven’t been around lately). Thanks for the gorgeous photos (and the wonderful stories!) of so many mouthwatering dishes. Here’s to another year of deliciousness! Hi Melissa!Happy Anniversary! I’m a newbie to food blogs but they’ve been my saviour whilst revising for university finals and yours is my favourite! All your beautiful recipes and pictures have lifted my spirits and have inspired me to study, inspired me to travel and inspired me to set my own blog up when the dreaded exams are over!Thanks a lot, please please keep writing! Congratulations on your 1 year anniversary; more to come! Just a suggestion… can you make your font size BIGGER as an increasingly visually impaired reader like I have a hard time reading… & considerably missing out on your message. Could not make the text size any bigger despite changing the ‘text size’ to Largest. Thanks for listening, & sharing your passions. Tanti auguri, Melissa!I hope the coming year brings you much joy and discovery in the kitchen and in life! Happy Birthday & Happy Anniversary: interesting how both seem apt! A Veggie Venture’s is tomorrow: I’ll "celebrate" by visiting the farmers market that opens that day! Happy Blog Birthday, Melissa! I’ve relished all your stories and photos over the past year and I can’t wait to see what the year ahead brings! Congratulations! Congratulations, dear Melissa! What a pleasure this year has been! Thank you for sharing yourself, your words, your kitchen, and your always impeccable taste. Here’s to more and more! Your post about working on the farm in France was hilarious! I have several friends who had great experiences with WWOOF. I still think about doing it myself but after reading about your experience I would be much choosier! I love reading about your travels as I haven’t had many oportunities in the last few years. Thanks. What a great gift to us all that you made that resolve. You certainly have a wonderful blog, always great reads..it has been a pleasure. Congratulations!! Happy 1st blog anniversary, Melissa! I’m sure that I’m not the only person who started blogging because she came across your blog and was totally inspired:) Looking forward to many more years of brilliant & well-researched writing and beautiful & mouthwatering photography! Congratulations! Happy Blogday to one of my favorites. Happy One Year! Keep your wonderful recipes coming. Poppyseeds are my all-time favorite. Any other poppyseed recipes you have to share? Please visit my new food blog:http://na-zdravi.blogspot.com/Congrats! Hiya, happy belated birthday! Been on the road and thus have been tardy in my well wishes. Hope all is well. Hi Melissa, I’m actually making two (!) of your cake recipes for passover (this one and the flourless chocolate cake). I was wondering if, in this mohnkuchen, you are supposed to whip the cream before folding it in. Many congratulations to you Melissa! I cannot believe you’ve only been at it for a year, considering the quality and unblemished calibre of your work. I raise a glass to you my dear, and wish you many more years of inspiring others with your talents. Happy Birthday to your blog. Nice blog and really good pictures.